Finally, we have arrived at my birthplace, San Diego. Not that I really got a chance to live here. My parents were in San Diego while my dad attended a Navy school for a couple of weeks. Our day started with typical hot, hotel continental breakfast. The girls and I enjoyed our favorite hotel breakfast food - fresh Belgian waffles. This is more like a dessert after you pour on the whatever fruit topping and then finish it off with a nice pile of whipped topping. We made good time on the IH-10 since the speed limit was 75 (translation 80-85). In Arizona we drove through Texas Canyon....this area had some of the most incredibly unique rock formations I have ever seen. Unfortunately, I missed the rest area exit which would have allowed some good photo ops. 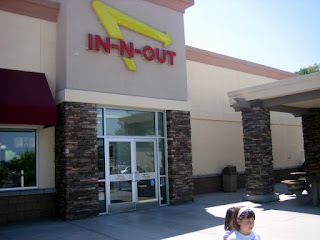 In Tuscon, we were presented with our first opportunity to enjoy In-n-Out, probably the best and, freshest fast food burger in America. 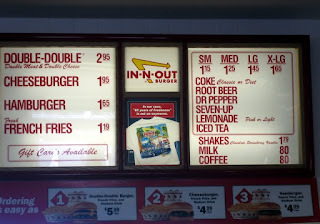 One of the cool things about In-n-Out is what I call menu simplicity. There's not much on the menu but, everything on that on menu is done to perfection. 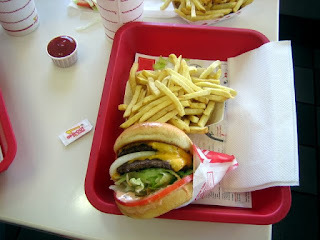 The last time I enjoyed an In-n-Out burger was 7 years ago in Las Vegas, the same trip Dianna and I were married in Caesar's Palace. So, today's visit was highly anticipated. I ordered the Double-Double and it did not disappoint. For a full review please click here to visit my burger hunt blog (coming soon). Our next pit stop was in Yuma and it was hot - 108 hot. I was amazed that this town appears to be growing at a rapid pace with many new housing developments and there were RV "resorts" everywhere. 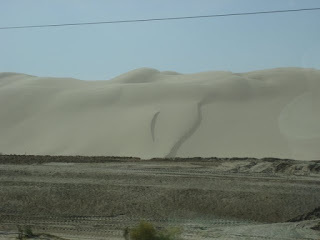 As we crossed the state line into California we drove through the Algodones Dunes. It looked like we were driving through the Sahara desert. 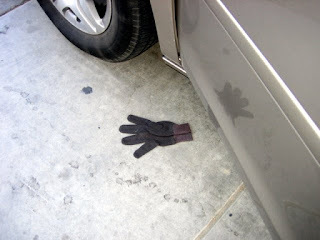 The border patrol had a very heavy presence in this area. Including many unmanned electronic surveillance towers. Not quite sure if this a good use of my tax dollars. There are more effective (and less expensive) ways to prevent immigration, IF you truly want to prevent it. Our drive continued into Imperial Valley. What surprised me about this area is all of the agriculture activity. I have never seen so much alfalfa hay. It was obvious this time of year is bailing season since there were huge stacks of square bails everywhere. My guestimate is these bails numbered in 1-2 million range. This bailing operation was completely automated, including picking up the bails off of the ground. Bailing hay was a popular summer job growing up...it paid pretty good for a teenager, but it was grueling, manual labor. I did it once to help a friend out...I don't recommend it. Imperial Valley is in a very dry, desert type climate.....so, how is this a major agriculture zone you ask (or, maybe you didn't)? I wondered.....but, as I drove I kept seeing and crossing over the All American Canal. I won't bore you here with the details, you can click on the link to find out more but, I will mention I have read that this is the largest irrigation canal in the world. So, that explains how an area that gets almost no rain produces so much agriculture. We arrived in San Diego about 6:30pm local time. 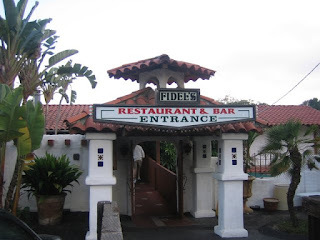 Based on some recommendations we decided to try out Fidel's which is in Solana Beach, just around the corner from the Del Mar racetrack. The food was great. If you want read my full review checkout my Mexican food blog. 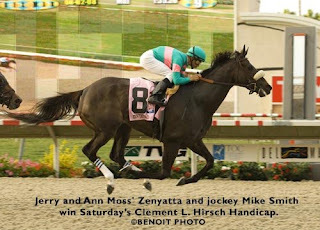 I was disappointed that I missed seeing my current favorite race horse, Zenyatta. She was on-track for the $300,000 Clement Hirsch Handicap about the time we were arriving in Del Mar/Solana Beach. This filly is a going to be a superstar.